NAMM 2017: Anyone familiar with our people's pedalboards gallery knows all about Voodoo Lab pedal power supplies, and now the company has turned its hand to pedalboards with the Dingbat Series. 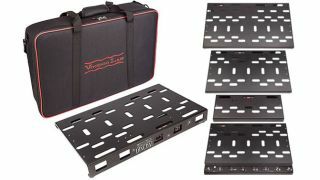 Promising a rugged, lightweight platform for organising pedals and cables, Dingbat pedalboards come in three sizes, all of which boast seamless integration with Voodoo Lab Pedal Power supplies. Also available is the Dingbat PX ($619-$679), which features an integrated Voodoo Lab PX-8 PLUS pedal switching system, while Dingbat Power Packages ($229-$399) include a factory-installed Pedal Power. It's a logical move from the pedal power supply manufacturer - check out Voodoo Lab for more info.